28 Mall x Tony Moly Pokemon! Plus enjoy more savings before 1 May 2017! Have you seen those cute Pokemon skincare and makeup that Tony Moly released a couple of months ago? If you haven't, check out these photos and I will give you a minute to ooh and ahhs. Now you can get these adorable limited edition masks and makeup because 28 Mall.com is now in Seoul, Korea! Shop at 28Mall by 1st May to enjoy 20% +10% HongBao early 30% off) offer for these new items stated below. For me, I'm getting either the Fairi (or Charmainder if you watch the english version) because I love that pokemon and always in need for brightening products! I want to glow like the fire on its tail lol! The Purin (or Jigglypuff) pact is cute too! Ugh I can't choose because they're all so cute so I might get them all! Which one are you getting? Don't forget that with RM150 purchase, you can enjoy FREE shipping cashback points on your shipping fee into your 28Mall account. For orders above RM200, get a free mystery Tony Moly gift (limited units. 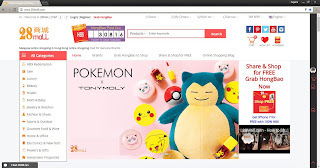 Right now, Tony Moly Pokemon limited edition beauty and skincare items are on sale up to 25% off and you can earn up to 28% HB$ cashback rewards after you post a review with photos after your purchase. HB$ (HongBao $) is 28Mall points system, and each HB$ is about US$1. If you view products on 28Mall, you can see that it has a $ (normal currency) and HB$ value, so you can use your HB$ to offset the price. Plus, you can enjoy extra 5% VIP discount when you use HB$! That's savings after savings! Register as a new member and up to HB$28 will be credited to your account! The best thing is that all products at 28Mall are guaranteed new and authentic with competitive price, so there's no worrying of getting fake or expired products. Ok, BRB making a new 28Mall account!